Since Scott Pilgrim vs The World: The Game released last month, people have been wondering when we were going to unlock the final secret character in the game. Nega Scott is easily attainable in the game, but there has always been a series of question marks indicating one character was missing. Speculation pointed to Knives Chau, Scott's 17 year old ex-girlfriend, and that she would be an unlockable with the DVD/Blu-Ray release of the movie. This is mostly true, as--yep--Knives Chau is the final playable character, and she will be coming, along with two new versus modes, for $2 to both XBLA and PSN sometime in November to coincide with the home release of the film. Knives herself is pretty awesome. Sporting the striped scarf she's known for, Knives has some very powerful attacks and can easily clean up the packs of emo and hipster opponents. For her special moves, she can throw explosive sai, a move that are probably the most powerful I've seen in the game and lights dudes on fire. Even more, when she's played, every character can only summon Knives' dad or mom, depending on the level. Overall, she looks and plays awesome, and has--by far--the most flair and outlandishness of any of the characters. Like I said, she's not the only addition. Two new modes will be showing up, and while they aren't ground breaking, they are fun. 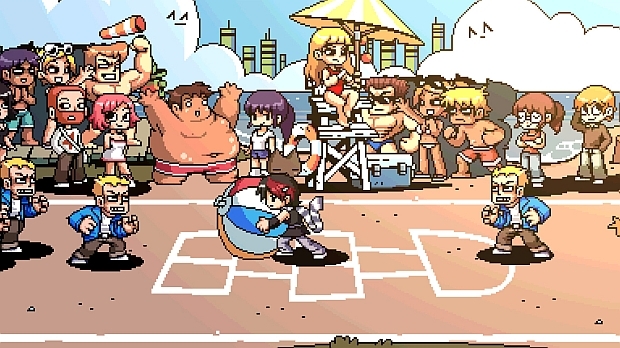 The first is a Dodge Ball mode, in which the only way to damage enemies and other players is with a giant beach ball. So it's not really a dodge ball mode, but it's at least different! Finally, the last mode is a variation on king of the hill, called Battle Royale. Players duke it out on a platform, and when knocked off, they have ten seconds to get back on. Again, it's not radically different, but it's a fun mode all the same. Finally, a patch is going to release as well. This patch will balance some of the difficulty problems and take into account some of the major bugs in the game. All in all, it's not a bad addition to Scott Pilgrim for only two bucks, and while they say this is the last bit of downloadable content, fingers-crossed we might be able to get even more.